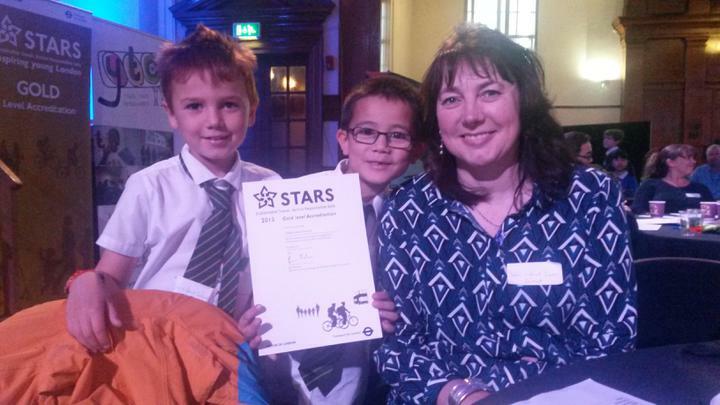 We are thrilled that our school has received the STARs Gold Award in recognition of our achievements in active and safer travel initiatives. The award was received by Freddie and Ashley (now in Year 3) with Vanessa Wishart, our School Travel Plan Coordinator and Wai-Yee Crees, our Chair of Governors, at a special ceremony. We are also delighted that Vanessa Wishart has gained special recognition for her work and has been named as a 2015 School Travel Plan Champion for the North London region. Congratulations and well done Mrs Wishart!